Welcome to the home of Gordon the Gorilla! 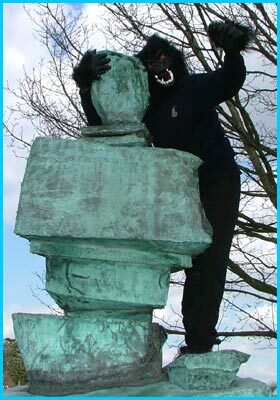 Gordon the Gorilla is Burgess Hill's celebrity beast. He escaped from Drusilla's Zoo in 2004 and found his way to the town. Gordon liked the area so much that he decided to make it his new home. In a short space of time he gained celebrity status and was featured in the local newspaper and on television. These webpages will keep you informed on what Gordon gets up to. From his beginnings as a gorilla in captivity in Drusilla's Zoo, his arrival in Burgess Hill and all the media coverage that followed, Gordon's story is detailed here. During his time in Burgess Hill, Gordon has managed to cause trouble and chaos wherever he goes. Burgess Hill Uncovered track Gordon's activities and capture what he gets up to on camera. Members of the public play their part in helping us keep track of Gordon by sending in their pictures if they spot him out and about. Without them, we'd never have known that he is fond of Vodka. Not just content with photos, we feed your multimedia appetite with video footage. Included is Gordon enjoying some time in a children's park, directing traffic and an appearance live on Sky Sports!